Vises left to right: fixed, rotating, rotary. Fly tying tools are designed specifically for fly tying. There are several different tools; this article discusses the most commonly used ones. The tools can come in kits for purchase. If you are just starting out, a kit with just the tools (minus the fly tying vise) is a more economical way to go. There are three designs for the fly tying vise. 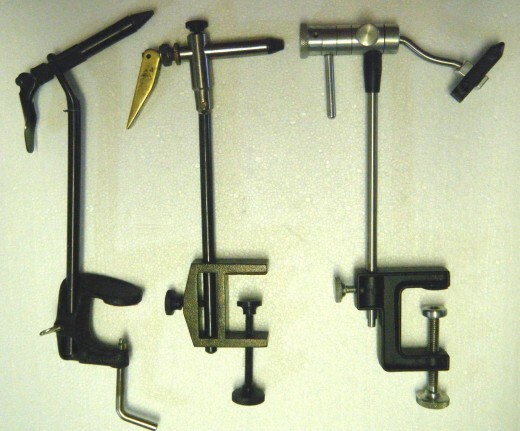 They are a fixed vise, a rotating vise, and a rotary vise. The fixed vise is the oldest design. 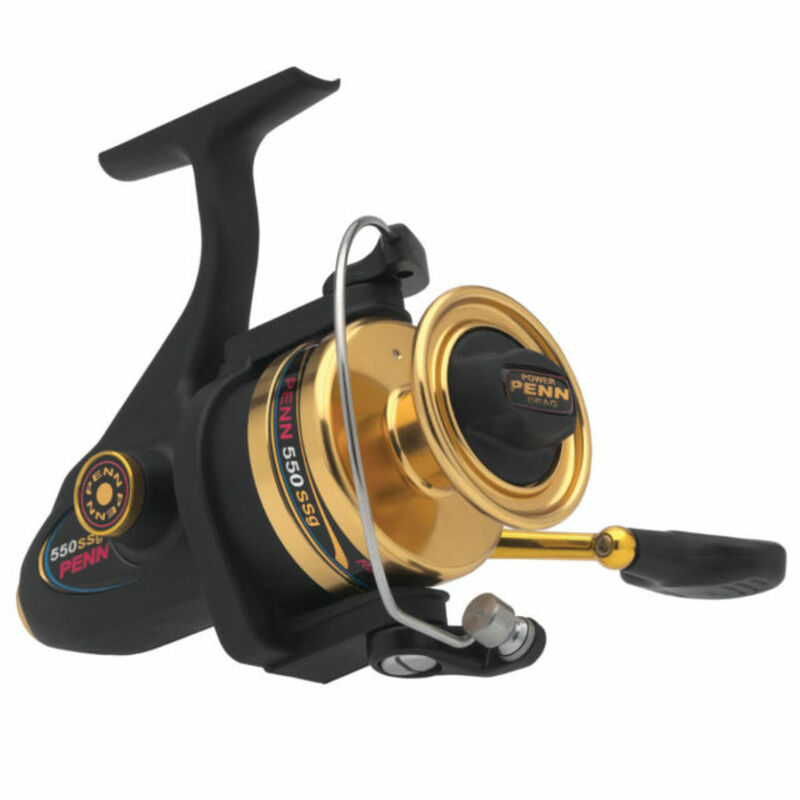 As the name implies, once the hook is placed in the vise, the hook cannot be moved. This type of vise sells for about $20.00 and is frequently supplied in fly tying kits. While they hold the hook secure, the novice tier will soon realize the need to rotate the hook and will move on to a rotating or rotary vise. Unless you are going to tie smaller, traditional trout flies that were developed with this type of vise, I would not purchase one. The rotating vise is similar to the fixed vise with the exception that the arm rotates within the stem of the vise. The advantage is that by rotating the arm, the bottom of the fly can be seen and worked with. Usually there is an adjustable set screw above the arm that the tier can release and tighten when the desired view of the fly is reached. Now, rotating vises have two designs. The first is that the stem of vice only allows the arm to be at a fixed angle, usually a 45 degree angle. This is not a helpful design because when you rotate the fly, the bottom of the fly is not level and results in limited access. 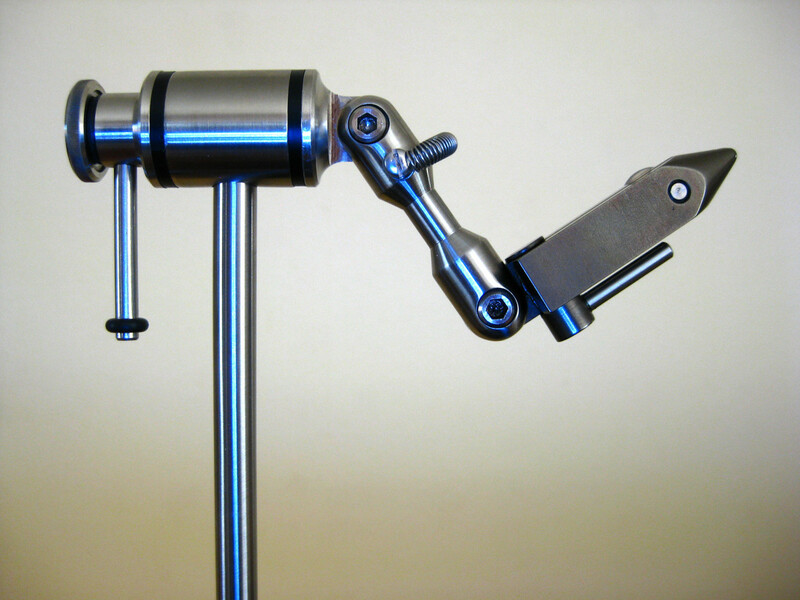 The second design is that the stem of the vise allows the arm to be set at different angles with an adjustable brace. If you know that you are going to rotate your fly, it is best to set the arm level so that the fly remains level upon rotation. 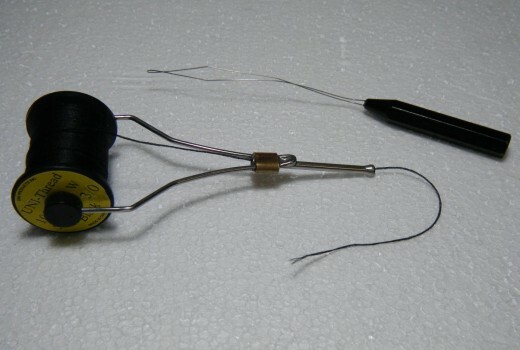 If you plan to tie saltwater flies that require a lot of tugging and pressure on the tying thread and hence the vise, the first design might, just might, be a consideration. The rotating vice ranges in price from $30.00 to $200.00. The rotary vise is designed to tie materials onto the fly as the fly is rotated. This is accomplished by having the vise stem allow rotation of the arm. The arm angle is level and cannot be changed, but the arm is bent in a characteristic "V" shape that it allows the fly to remain level while rotating. Another unique characteristic of a rotary vise is that there will be some type of lever on the back of the arm that allows the tier to rotate the arm. The tier can lock the arm so that the vise functions as a fixed vice. The rotary vise appeals to tiers who tie medium to large size flies that require materials (such as silk floss or yarn) to be wrapped around the hook's shank. This vise wraps the material much faster than a tier can wrap the material around a stationary hook. The trade off is that smaller flies require more control when wrapping and control is lost when using a rotary vise. If you plan to tie smaller flies, a rotating vise with an arm that can be made level may be a better vise for you. The rotary vise offers the most flexibility, but with more moving parts, costs more. Prices range from $85.00 to $600.00. If you do purchase one, purchase one that can have a bobbin rest attached to it. The bobbin rest is addressed later in this article. Finally, all vises give you the option of having them be secured with either a C clamp or heavy base pedestal. The C clamp is usually attached to a table edge, while the base plate can be placed anywhere on the table. The C clamp is more stable and better suited for larger flies that require high tension on the thread while tying. Me, I prefer to stand while tying and have constructed an elevated wooden platform and attach my vises on it with their C clamps. Flies are tied with thread. A bobbin is an essential tool in that it holds the thread spool and guides the thread through a tube - all held in the tier's one hand. To keep the thread from unraveling and thus releasing materials, the thread must have constant tension on the fly until the fly is finished. A bobbin has enough weight that the tier can let go of the bobbin without the thread unraveling. I've had bobbins that had a sharp orifice at the end of the tube and cut the thread while tying. Purchase one that has either a ceramic tube or if a metal tube, a fluted orifice. While not an essential tool, a bobbin threader can save you much time when threading the bobbin. 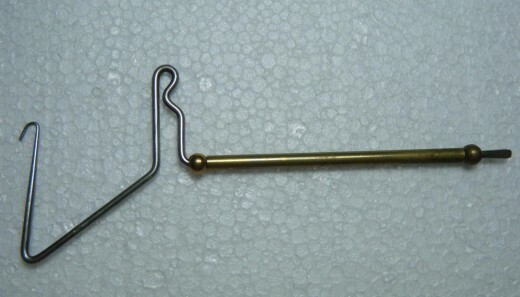 A bobbin threader works on the same principle as a needle threader. The bodkin is a needle type awl. It is most frequently used to pick materials out from under the the thread that the thread has tied down. It is also used to precisely apply glue or nail polish, and to punch holes in material. Hackle pliers hold a feather called a hackle. A hackle feather is a long, narrow feather that is typically wrapped around the hook's shank near the eye of the hook. Hack feathers are difficult to hold onto with fingers, so the pliers clamp on the feather and allow the tier to have more control. All hackle feathers need to be tied off when the feather wrapping is complete. The hackle pliers allow more access than fingers to tie off the feather. Some pliers come with rubber jaws to better grasp the feather while other are bare metal. I've tried both and have not noticed an appreciable difference. 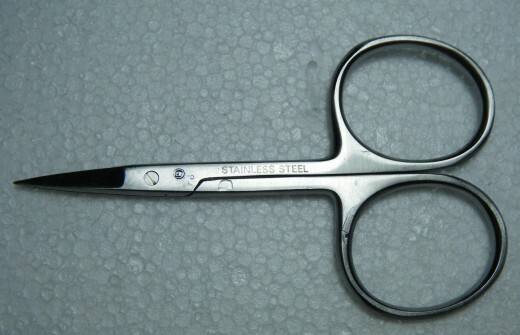 Fly tying scissors are unique. 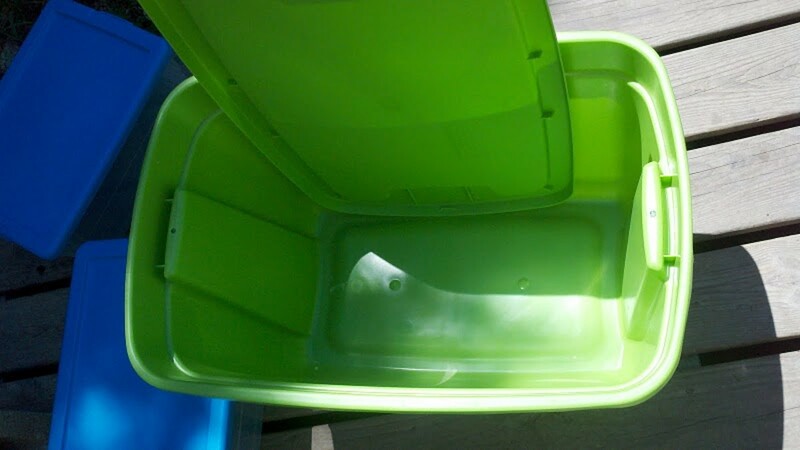 They have large holes in the handles, have short handles, and have narrow blades. This is because some commercial tiers will hold onto the scissors during the entire tie. They wrap the handles around their ring finger and thumb while tying and cutting. Much of the cutting you will do will require you to cut flush with the hooks, so narrow, pointed blades are a must. If you will cut wire to tie on your flies, serrated blades are recommended. Nearly all flies end with a knot just behind the eyelet of the hook. The whip finisher ties a lash knot at this location. The tool relies on tension to tie the knot. Whip finishers come in two sizes - small and large. The smaller whip finishers will work on most flies. 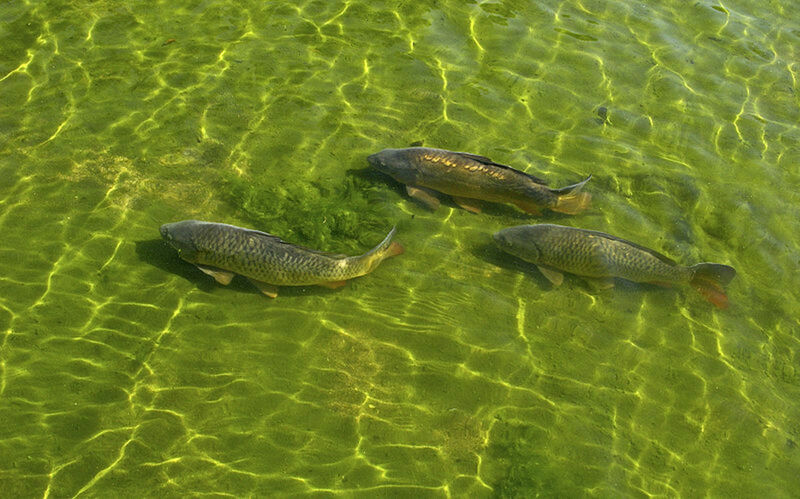 Larger ones should be used on larger flies. There are two styles of whip finishers. One is simply called a whip finisher, the other a western whip finisher. The western one relies on a spring loaded arm. Being left handed, I've found the western one awkward to use and rely on the standard design. Rotary vices often times will offer a bobbin cradle. The role of the cradle is to pull the tying thread level with the hook so that when turning the hook to wrap on floss or yarn, the thread does not wrap around the hook. The disadvantage is that the cradle can sometimes get in the way while tying the fly.